In order to understand the Meats4Life Club Membership, let's take it down to the basic definition of a co-op. 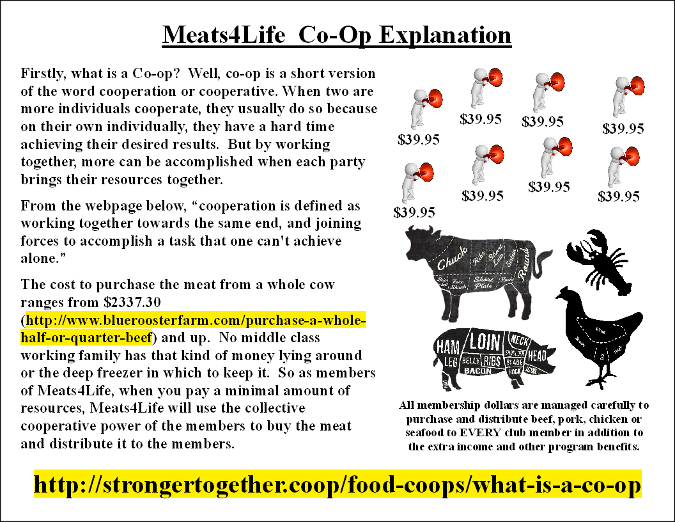 Perhaps the best resource we've found would be the article posted on strongertogether.coop A Co-op or "cooperative exists to serve its members, but what makes co-ops unique is that the members are also the owners." Every Meats4Life Club Member is a co-owner, so every member that joins the Club receives benefits from the program in the form of "paid for" meat orders, extra cash bonuses, and more. Click the image below to view in larger size. Very good question. Why have different membership pricing and perks to meet every budget. Below are the options and benefits of each. 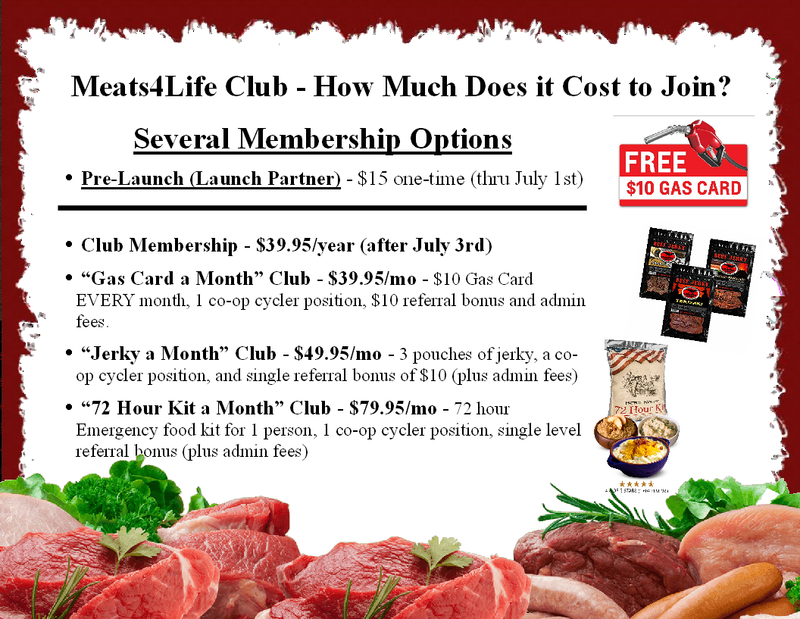 $39.95/yr gets you up to a 50% discount on your meat purchases from our Cold Storage Release program outside of what the club pays for. Additionally, Club Members enjoy a 2-level referral bonus program of $10 per referral and $10 per each of their referrals' referrals, which bonuses renew annually for passive residual income; cycle bonuses of extra cash, paid deliveries of meat, grocery gift cards, and other awesome packages of CutCo Knives, Tupperware, JR Watkins products and much more. 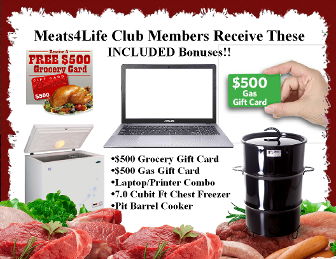 Members area admission, giving you access to marketing materials, downloadable eCookbooks, printable grocery coupons to help stretch your grocery budget, and other bonuses to be added. Lifetime banner ads for up to 2 opportunities on rotation on YOUR personalized landing page. CYCLE to EARN MEAT and MONEY!! 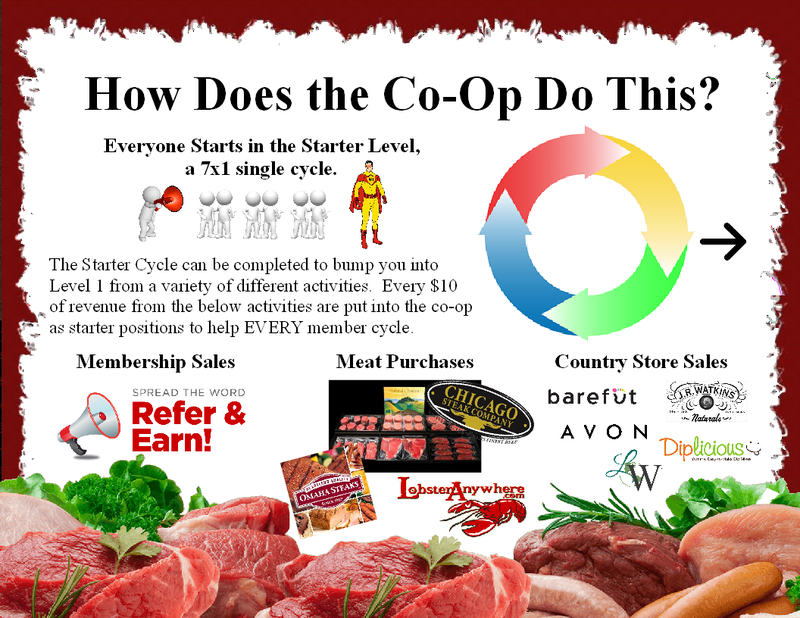 The Club Membership is structured as a 7x1 cycler program with repeat positions Levels 1 thru 4. This is how it will last in perpetuity. And since the membership is an annual one, it keeps moving, and you'll keep receiving your meat, or your meat money if you are an international participant. Everyone starts in a quick 7x1 Starter cycler. Refer 7 and you advance to Level 1, another 7x1 cycler. 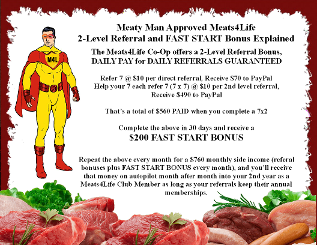 Help your first 7 each refer 7, and you'll have earned $560 in referral bonuses from 2 levels of referrals, completed a Level 1 cycle for another $60 bonus, and advanced to Level 2. You may choose to repeat the process each month for monthly residual income each subsequent year by selecting a monthly product subscription option. 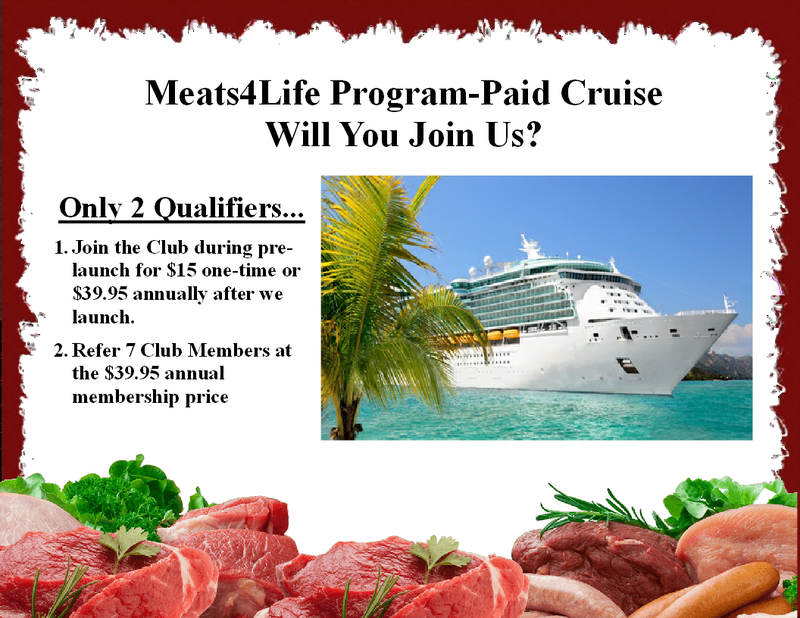 Most everyone eats meat and can benefit from the HUGE opportunity provided by this program. Once you've completed Level 1, you're given another Level 1 position to start cycling again, and you're given a Level 2 position. We pay you a $60 bonus for completing each Level 1 cycle and another $60 bonus when each of your personal referrals complete a Level cycle. 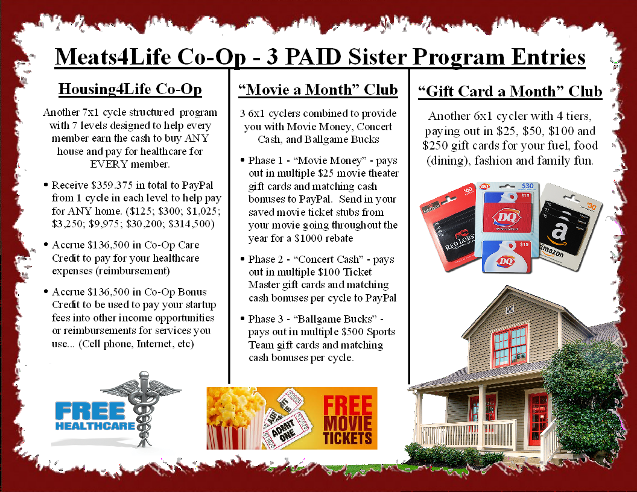 We all pay your way into our 3 sister programs for HUGE savings on movie tickets, gift cards and money to pay cash for any house and paid for healthcare. 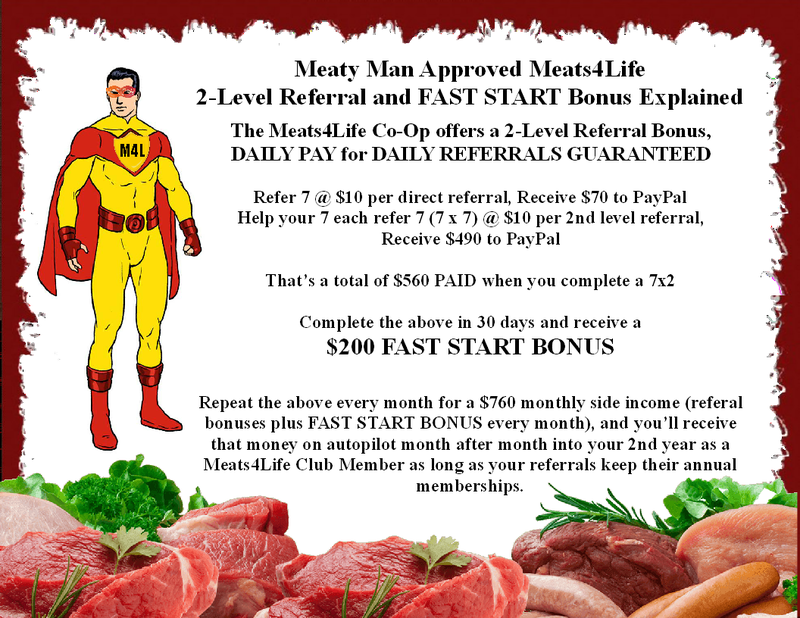 Level 2, when the 7x1 is completed, pays out a $180 cash bonus to PayPal AND pays for your first order of meat, jerky or vegan products. You'll receive another Level 2 cycle position and a Level 3 position. Your meat, if you're picking it up from our cold storage release program, being supplied either by Colorado Choice Distributors or Chef's Classic, is frozen in vacuum sealed packaging. If you're not living near one of our cold storage locations, that's fine. We'll pay for an order of your favorite meats through one of our other meat partners that will have it shipped to your home..
Level 3, a 7x1 cycle, upon completion, pays out $720 cash to PayPal, a deep freezer, another order of meat or vegan products, another Level 3 cycle position and a Level 4 position. Each subsequent Level 3 cycle, in lieu of the deep freezer, you'll receive a $500 grocery gift card. Additional revenue from Level 3 is used to open additional cold storage locations to make access to RESTAURANT QUALITY meat accessible to more members. 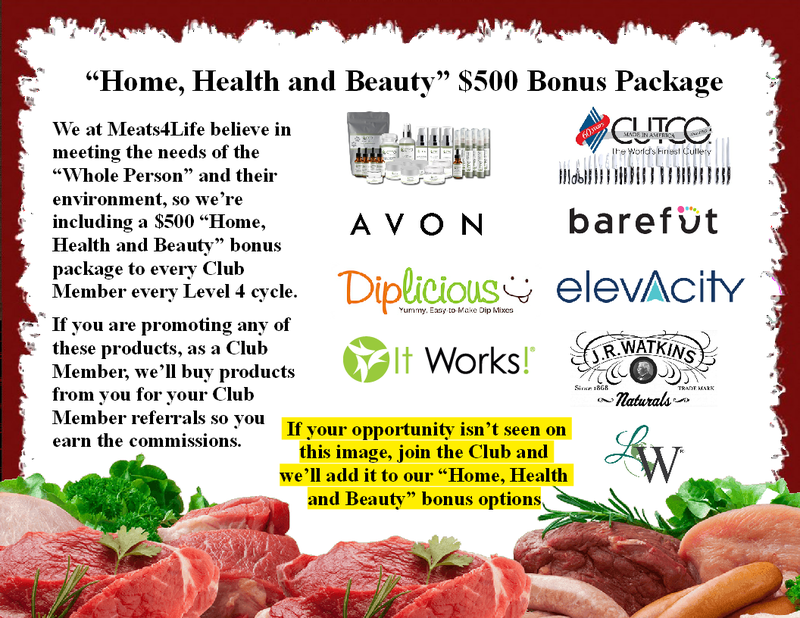 Pays for 10 PIF Certifiicates to help 10 other people join our program. Pays for your Costco or Sam's Club Membership, or both EVERY year. 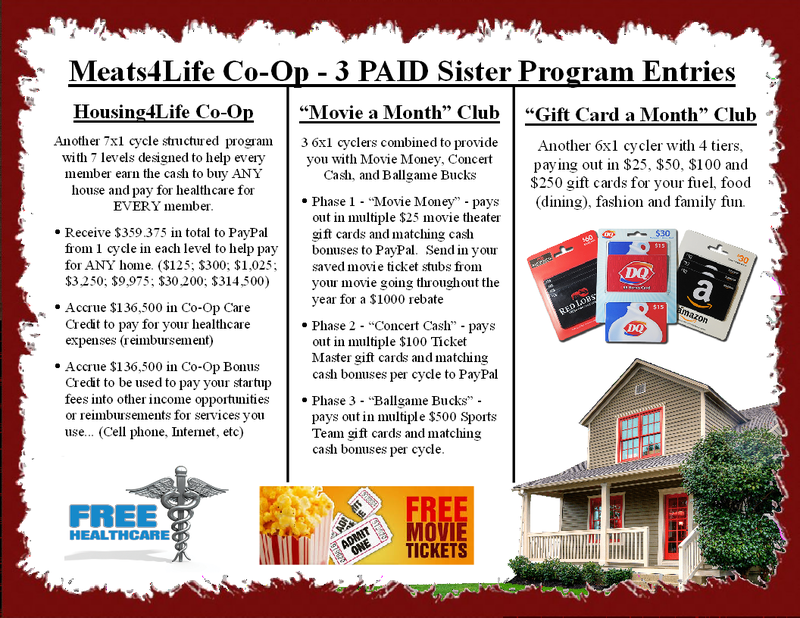 The program operates in 4 Phases, and then renews. 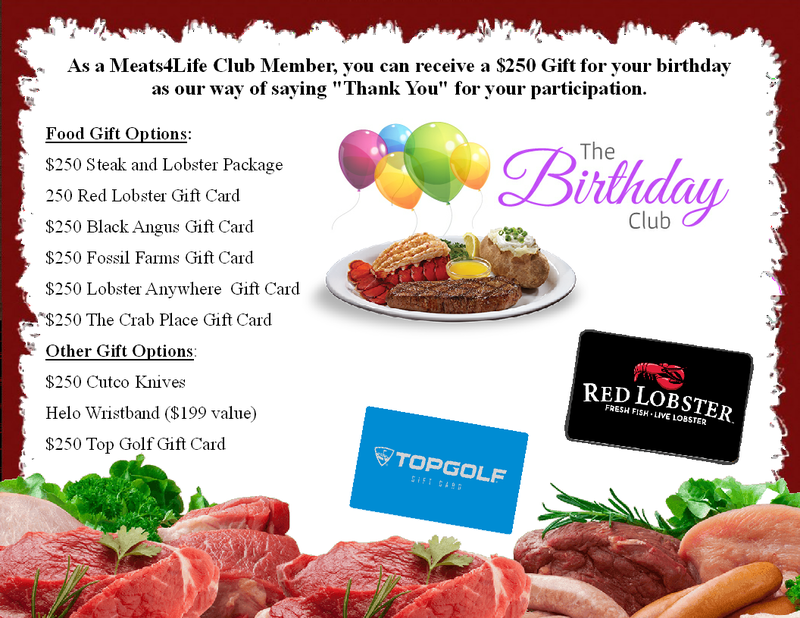 If you want to change your meat option, simply send a "Contact Us" message and we'll make changes to your record to reflect your request. It's a very simple program with HUGE value. Plus, when your referrals keep renewing their membership every year, you keep earning referral bonuses every year to pay for your membership. 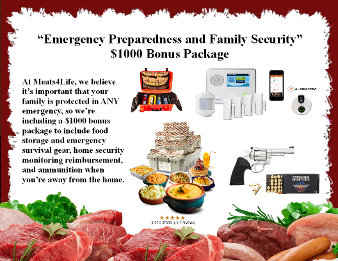 Refer as many as you like for more residual income and an endless supply of meat for your freezer. As a Club Member, you can earn additional income and co-op earning positions for simply referring customers that purchase cases of meat from our cold storage release program. You will earn based on the below scale. Instead of earning just a single commission, you can earn a commission and additional earning positions for residual, passive income. 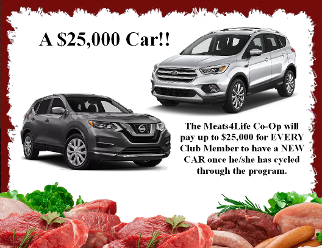 in partnership with and as a marketing arm of Colorado Choice Meats.